The Auschwitz exhibition at Madrid’s Arte Canal Exhibition Centre, first opened its doors last December. Since then, it has attracted over 475,000 visitors. A handful of special new objects are now on display as it enters its final months in the capital, its only stopping point in Spain. The collection of over 600 original artefacts is complemented by three new items from Anne Frank House in Amsterdam. The first is the handle that operated the door to the “secret annex” where the Frank family lived. The second is a book on botany given to the author of the famous diary for her last birthday. The third is a tourist guide to Holland in Spanish, which belonged to Fritz Pfeffer, who lived with Anne Frank from autumn 1942. The three objects from Amsterdam will be on display with the other items from the collection Madrid’s Arte Canal Exhibition Centre until 3 February, the final extension to the end date. The exhibition will then continue its international itinerary, leaving Europe for the next few years. The door to the secret annex in which the Frank family lived was hidden behind a bookcase built by Johan Voskuijl in August 1942. The handle now on display as part of the collection in Madrid was concealed at the back of the bookcase. Attached to a piece of string and fastened by a hook, it was used to open and secure the entrance to the hiding place. 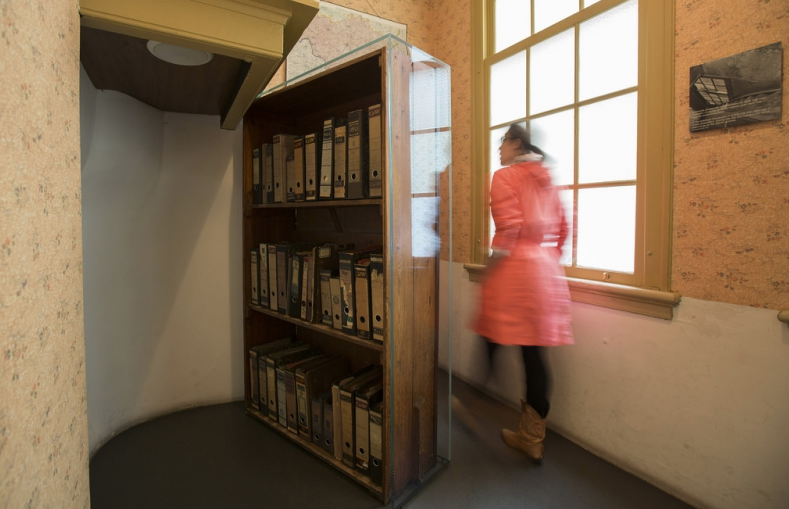 The original bookcase can be seen at Anne Frank House, although the wooden handle is not on public display for conservation reasons. Following the persecution of the Jewish population from November 1938, the Jewish and German dentist Fritz Pfeffer emigrated to Holland, where he became friends with the Frank and van Pels families. In autumn 1942, he joined them in the secret annex where they tried to live unnoticed. It was there that the dentist shared a room with Anne Frank, who referred to him as Albert Dussel in her diary. During the time they were in hiding, Fritz Pfeffer tried to learn Spanish on his own, hoping to start a new life in South America when the German occupation was over. One of the books he tried to learn from was the Spanish tourist guide to Holland. Anne Frank makes various references to this largely unsuccessful process in her diary. For her 15th and final birthday, Anne Frank received a book on the principles of botany (Beginselen der Plantkunde). It contains the hand-written inscription: “Anne Frank, 12 June 1944, annex”. The book, which was acquired by Anne Frank House in 2012 was the last present that Otto and Edith Frank, her parents, were able to give her. The Anne Frank House is an independent, non-profit organisation dedicated to the preservation of the place where Anne Frank went into hiding during the Second World War, and to bringing the life story of Anne Frank to the attention of as many people as possible worldwide with the aim of raising awareness of the dangers of anti-Semitism, racism and discrimination and the importance of freedom, equal rights and democracy.